In studying this, I noticed similarities to the form used to address messages to the churches in Revelation. Those were written on a single scroll so each church would hear their individual message as well as the messages to the other churches. The letter employs the same concept of different messages to different groups embedded within a larger message written on a single scroll. Like Revelation, when the letter is read, each group would hear their individual message as well as the message to the other groups. Also, if the letter was written by John in Ephesus, as tradition holds, then the letter would very likely be taken to other churches and read there. In this case the seven churches in Revelation would receive the same message having the seven-fold messages to the different groups at each location. Is this evidence that the author of the letter was familiar with Revelation and patterned their letter using the concept of the letters addressed to the seven chruches in Asia? According to Wikipedia, early Church tradition dates the Book of Revelation to end of the the reign of emperor Domitian (81–96), or some time in the early to middle 90s, and most modern scholars agree. This means that the author of the Johannine epistles could have known the Book of Revelation, as long as he was writing during the early years of the second century, a view now held by most critical scholars. I expect that the seven letters contained at the start of Revelation were originally separate letters sent to each church and only later consolidated into this book, but it is also possible that they are only symbolic and were never really sent to these churches. In any case, this does not answer the question because if the 'elder', author of the Johannine epistles, did know Revelation, he probably knew it in its completed form with letters included as we see them now. 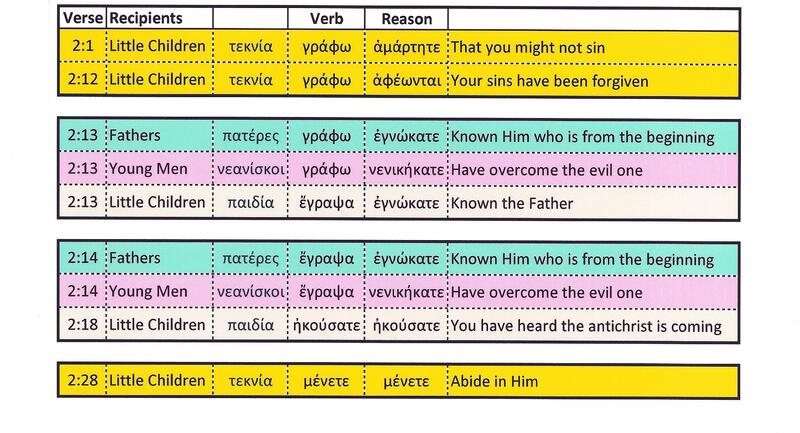 True, we can argue that 1 John chapter 2 contains messages for seven groups, but only by assuming that τεκνία and παιδία are not synonyms and then by ignoring the poetic use of repetition in 2:24-18. Malcolm Coombes ('A Different Approach To The Structure Of 1 John') says that particular features of rhetorical style in 1 John prominently feature the use of repetition for amplification and emphasis. This observation in itself explains the fact that the ideas in verse 2:13 are substantially repeated in verses 2:14-18. It is most unlikely that the elder would write to "little children" who are by etymology less than seven years old, so we do not need to consider that the elder is writing to one or two groups of little children. We often use synonyms in English, even in a short essay, and so it was in Koine Greek. No doubt the elder was simply referring to members of his flock in the same way as the Church Fathers would later do, and even some modern priests still do. I think it is evident that the messages of this epistle were addressed to just one group, whose members the presbyter often referred to as his "little children". Given that there is no evidence that he was addressing seven distinct groups, we have no evidence that 1 John was patterned on the Book of Revelation. Not the answer you're looking for? Browse other questions tagged revelation 1-john or ask your own question. Who are the “children”, “fathers” and “young men” addressed in 1 John 2? Is there any exegetical reason for believing the seven churches of Revelation correspond to seven successive “church ages”? What are the idols and who are the little children? What is the new commandment in the letter of 1 John? Is “children” or “little children” the best understanding for παιδία in 1 John?